I don't seem to be able to complete this. The most I can do is take out the top right and bottom left bases with a truck rush and about 10 MG bunkers in each base, but when I try to defend the derricks inside and outside the bases, I'm attacked by HVC Python Hovers and HC Python Tracks at around 10-15 minutes which run through lancer hardpoints like nothing, before I can get into anything big like howitzers/lasers/scourge missiles. I might try a few more times while truck rushing everyone else and seeing if I can take them out that way, but I highly doubt they'd make the challenge that easy to beat. Holy crap. Finished in about 1h 20 mins. Early MG Cyborg rush was able to take out 4 of the 5 enemy bases while only losing my top ally. I wasn't able to do that to the last guy though, he blew through my MG and AG borgs with a cannon fort(at 25 minutes? jesus). Although the last one was ahead of us in research for a good while, we were able to wear him down with garrisons of heavy tanks and VTOLs and eventually chipped away at his base for about 40 minutes till he had nothing left. Also keep in mind I did all of this with nothing but my first 4 derricks for most of the game. No saves or time slowdowns were necessary, and I actually had the game running on 1.5 most of the time. I think this can be almost halved with well-prepared thermite vtols. Considering i only rushed one base with borgs and one base with towers. Also, it's quite easy for your team to get a cannon fort in 25 minutes. http://youtu.be/AzcKComK40Y (whenever it finishes uploading). edit: not the best result, for sure, this was very relaxed. lets see what i can do with pure rush. I prefer HEAPs personally, I like when things go down fast so I don't have to wait and see if I need to make another pass. Thermite bombs are fast though. I'd do that with plasmite bombs(although nothing would be standing anyway) but thermites on any body go quickly and by the time I decide I want to make another run I'll probably be out of bombs. NoQ wrote: I think this can be almost halved with well-prepared thermite vtols. I have read all of the previous posts but I am still looking for a reasonable approach to this challenge. I also,would like to understand how to effectively interact with the AI allies. I have tries to rush in with trucks but they get eliminated by the MG tanks & although I have tried to rush with cyborgs, I do get further but don't last lo g. Any help would be appreciated. Schwager1 wrote: I have read all of the previous posts but I am still looking for a reasonable approach to this challenge. I also,would like to understand how to effectively interact with the AI allies. Best time I've done this challenge in, is just over 17 mins. Strategy: Like kizito06, the central wells, early on, are key. I use small teams (4) of machine-gunners to guard the wells and pick off enemy strays, and then reuse them to secure front line pushes. After I've taken two bases I switch to making Grenadiers (absolutely devastating) & one plant of Lancers. Slow the game down. Cyborgs only. Collect oil cans as soon as they are spotted as new ones will appear to replace them (approx 10 cans on the map at any one time). Research: 3 Buildings; Always "research module" then combos of armour & guns to help the machine-gunners. I use thermite VTOLs at the end too. I don't build any fighting units - just 13 trucks. I take the middle derricks, protect with machinegun towers, build two machinegun towers on the ramp of the bottom middle base and rush a truck through the base to build two machinegun towers to take the base derricks. I research straight for VTOLs and superhot flamer gel. Once allies have researched lancers, I build lancer hardpoints to hold the middle and protect my derricks and allied bases. This give me enough money to keep up full research, build 4 VTOL factories and a bunch of rearming pads in the middle of the map. Then once thermite has been researched, I have 4000+ in the bank to start pumping out thermite VTOLs which I use to take out all enemy production facilities and mobile units, which wins the game in under 20 minutes every time. If allies choose flamer research early on, the game takes 17-18 minutes. I vary the speed throughout the game so that no time is taken up with me clicking - all the time taken is just doing the research and using the VTOLs. Enemy don't build AA until attacked by VTOLs, so if you look after your trucks, you don't have to lose a single structure or unit. Huge thanks to NoQ for his video, it was my starting point, then I refined it all over and over and over within a good 100 attempts. My time gradually decreased from 2 hours 40 minutes, which is what you get when you only rush one enemy base, to approximately half an hour, then finally to the time shown in the video above. 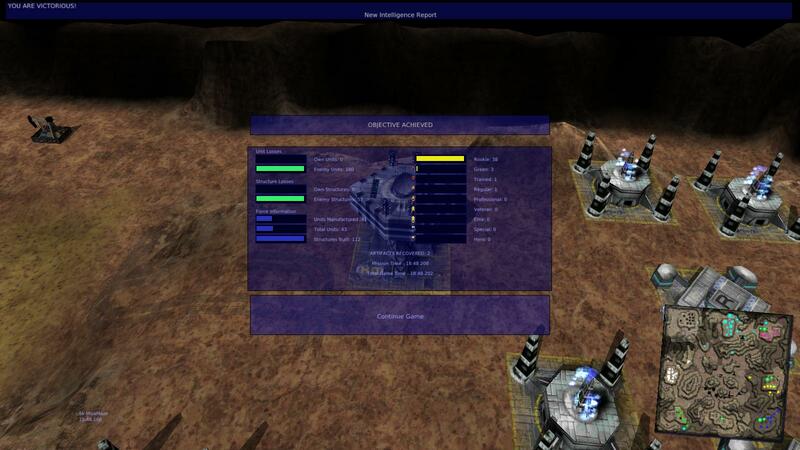 The AI is a bit dumb when it comes to micromanagement, rushes and battles in the confined space of MizaMaze. Also, there seems to be a bug where enemy light tanks slip between your tower and the three-quarter-cliff tile right next to the tower - I think they aren't supposed to be able to do that. Oh, forgot to add that using VTOL bug HEAP's yields ~18:30 for me. That's taking all the oil in the middle and spoiling the additional, fifth enemy derrick where I can.